This page is written by the game's inventor, Fergus Duniho. Yáng Qí is my somewhat presumptuous attempt at improving Chinese Chess (a.k.a. Xiàng Qí). Yáng refers to the active, masculine principle in Chinese cosmology, as distinguished from Yin. It is associated with such positive qualities as strength, light, and life. As part of the name of this game, it indicates that this game is generally played with stronger pieces than Xiàng Qí is. Qí (pronounced chee or key) is the Chinese word for a strategy board game. Yáng Qí happens to be the official transliteration of these two Chinese words. The game may also be called Yang Qi, Yangqi, Yang Chi, or even Yankee. As a matter of serendipity, the creator of the game is a Yankee. I didn't really notice the pun until I had already decided on the name. Chinese Chess is unbalanced in favor of orthogonal movement. Pieces that move diagonally, such as the Guard and Elephant, are much weaker than pieces that move orthogonally, such as the Chariot and Cannon. The armies are very weak, especially for a larger board than Chess is played on. The Horse, Elephant, and Guard are all very weak pieces. The General is also weaker than the Chess King. Pawns cannot defend each other. In general, pieces are uncoordinated and cannot defend each other very well. The fortress and river create barriers that artificially restrict movement, sometimes leaving a player unable to attack the enemy King even when he still has some pieces left. Undoubtedly, Chinese Chess is a good game, and some of its good qualities get lost in Yáng Qí. Nevertheless, it gains many of the good qualities of orthodox chess, and it makes good use of one of the best things about Chinese Chess, which is the Cannon. Generally, Yáng Qí corrects all of the alleged flaws I have just enumerated. 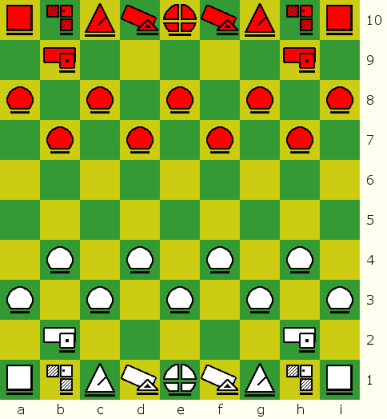 It balances diagonal and orthogonal movement by replacing Elephants and Guards with Bishops and Diagonal-moving Cannons, by giving the King diagonal movement, and by letting Pawns capture diagonally, as they do in Chess. These same changes make up for weaker pieces, let Pawns defend each other, and make pieces more coordinated and better able to defend each other. I have also replaced the non-jumping Horse with the Knight from Chess, added some more Pawns, and removed restrictions on movement imposed by the fortress and river. The pieces, board, and setup are somewhat different (see below). Pawns get a double move from the third rank, but Pawns starting on the fourth rank do not get a double move. On reaching the last rank, a Pawn promotes to any one of the player's captured pieces (not including captured Pawns). If no captured pieces are available, a Pawn cannot advance to the last rank. When a King is not in check, it may swap places with a neighboring piece of the same color, except a Pawn. This counts as the player's whole move. King The King moves one space in any direction, but may not move into check. There is no castling in Yang Qi, but the King does get another special move. When it is not in check, it may swap places with a neighboring piece of the same color, except for Pawns. It may use this power multiple times and never loses it. Its main purpose is for letting Bishops and Canons change the color of the squares they move on, though it may also be used with Rooks, Cannons, and Knights. Horse The Knight [Horse] moves as the Knight in Chess, jumping in an L shape, to any space that is two ranks and one file or one rank and two files away. This is the leaping Knight from Chess, not the non-leaping Knight from Xiang Qi. It is called mǎ in Chinese. Chariot The Rook [Chariot] moves as the Rook in Chess, sliding any number of spaces orthogonally. It may not jump over any pieces. It is exactly the same as the Chariot from Chinese Chess. Sage The Bishop [Sage] moves as the Bishop in Chess, sliding any number of spaces diagonally. It may not jump over any pieces. It was renamed Sage for the Chinese version, because Chinese uses two characters for Bishop instead of a single character. The character used is called shèng. Cannon The Cannon moves as the Cannon in Chinese Chess. It moves as a Rook, except that it must jump over an intervening piece (called a screen) to capture a piece. When it doesn't capture a piece, it merely moves as a Rook. Its Chinese name is pào. Arrow The Canon [Arrow] moves like the Cannon from Chinese Chess, except that it moves diagonally like a Bishop instead of orthogonally like a Rook. It moves as a Bishop, except that it must jump over an intervening piece (called a screen) to capture a piece. When it doesn't capture a piece, it merely moves as a Bishop. The name is a homonym for Cannon, but it refers to a kind of cleric rather than a type of artillery. The clerical name puts it in company with the Bishop, and I liked the pun on Canon/Cannon. It was introduced by T. R. Dawson, who called it the Vao. In the Chinese version, I use the name Arrow. The Chinese word for Arrow (shǐ) resembles the name of the piece it replaces (shì), and it also means the English verb vow, which sounds like the original name for this piece. Pawn The Pawn moves as the Pawn in Chess. It moves forward one space, but is allowed a double move from its player's third rank. A Pawn captures by moving one space diagonally forward. If a Pawn makes a double move to a space alongside an enemy Pawn on its fifth rank, the enemy Pawn may capture it by en passant. Upon reaching the last rank, a Pawn may promote to any of the player's captured pieces. You could say that it is liberation of a captured piece rather than promotion of a Pawn. If no captured pieces are available, a Pawn cannot move to the last rank. Use algebraic notation as you would for Chess. According to the Fairy Alphabet introduced by Anthony Dickins in A Guide to Fairy Chess, P should be used for the Cannon, which is also called a Pao, and V should be used for the Canon, which is also called a Vao. Record Pawn moves without the use of any letter to identify the piece. If you want only minimal notation, you can record a King/piece swap as a King move, letting the context show that you are swapping pieces. For fuller notation, put a semicolon after the King's move and record the other piece's move to the King's space. Using regular Chess sets, you can play this game with the pieces from two Chess sets of the same design and one more of another design. Use one set for regular Chess pieces, and get an extra Pawn from the set of the same design. From the set of another design, use the Bishops for Canons, and use the Rooks for Cannons. If you don't have two sets of the same design, you can make do with an extra Pawn from the set with a different design, or you can play a variant that uses fewer Pawns. If you have an Omega Chess set, you can use Wizards for the Canons and Champions for the Cannons. Another possibility is to use two sets of Chinese Chess pieces. 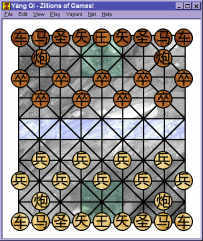 For the board, you can use a board for Chinese or Korean Chess, as they have all the same coordinates, but with Bishops and Canons, it will be better to use a checkered board. I recommend cutting up floppyboards and piecing them together into a 9x10 configuation, but expense may not make that feasible for everyone. You could piece together posterboard tiles, overlap four thin Chess boards, or just draw a board, perhaps on posterboard with the help of a lip edge ruler. If you already have a 10x10 board, you could just partition off one file and use the remaining area of the board. In the Chinese Chess setup, there are five Pawns on each players fourth rank, with none on the third, and Cannons start on the third rank, not the second. The five Pawns start on files a, c, e, g, and i.
QuickPawns can move one or two spaces forward on any turn. They capture as regular Pawns, one space diagonally forward. They are based on Kevin Begley's Quick-Pawn, but they differ in a couple respects. Whenever one QuickPawn moves alongside an enemy QuickPawn with a double move, the enemy QuickPawn may capture it by en passant on the following turn. Also, a QuickPawn promotes only on the last rank, not the second-to-last rank. Berolina Pawns move diagonally forward and capture straight forward. Since they start on the fourth rank in the Chinese Chess setup, they get no double move. Chinese Pawns move and capture one space straight forward. From the sixth rank and beyond, a Chinese Pawn may also move and capture one space sideways, i.e. left or right. I made only one modification to the Chinese Pawn. Upon reaching the last rank, it may promote to any non-royal piece in the game. You may play Yáng Qí on your computer with Zillions of Games. I have made two versions of Yáng Qí, which differ in graphics and piece names. The western version uses the piece graphics shown in the setup diagram above. A reduced image of the oriental version is shown to your left. Note: On June 21, 2001, the ZRFs were updated with the new restriction on Pawn promotion. The oriental edition was updated with two new piece sets, and the Vao piece was changed to an Arrow.